Signal50 Lamper og sirener til advarselstårne. 50 mm diam. Click on a component to quickly scroll to order: Base units, Light Modules, Incandecent Bulbs, LED Bulbs, Sound Modules, Junction Boxes, Accessories. 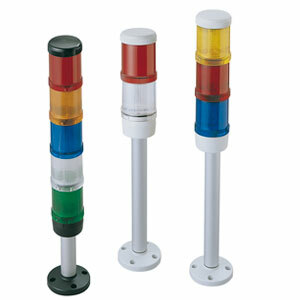 SIGNAL 50 warning tower lights from the J. Auer company are the perfect compliment to any industrial control system. High grade, heavy duty and comprehensive, this 50 mm diameter space saving range is also flexible and extremely easy to assemble and install. In comparing SIGNAL50 warning tower lights to competitive products from manufacturers including Patlite, IDEC, Federal Signal and Werma, the SIGNAL50 range offers more features, approvals and options than any of these major stack light manufacturers. Heavy duty industrial polycarbonate is used to construct all light modules and bases for the SIGNAL50 line. A stainless steel, polemount base, set on zinc die-cast metal foot is also available. The entire range meets UL Type 4/4X/13 and IP65 guidelines for use indoors or out. No other manufacturer of competitive product offers this extensive range of environmental approvals. Variety and interchangeability are standard with the SIGNAL50 range. Six lens colours are available (green, red, amber, blue, yellow and clear), more than any other major manufacturer. Light modules are offered in four different voltages including 12 and 24 Vac/Vdc, 120 and 240 Vac. Illumination types include incandescent, LED and strobe. A special flashing LED is also available. A variety of base units are available. Bases include a mounting foot, extension tube and pole cap. Light modules are available in a variety of colours in either steady, flashing or Xenon strobe configuration. Incandescent or LED light sources are available. The incandescent lights are lower cost and brighter than the LEDs, however, the LEDs have a greater bulb life. You may use up to 5 light modules or 4 light modules and one single circuit sound module or 3 light modules and one dual circuit sound module. Please match the LED colour to the light module colour. Also note the Xenon strobe modules include bulbs. The single circuit bi-tonal sound module may be used with up to 4 light modules. The dual circuit sound module may be used with up to 3 light modules. The plastic bases mount on top of the junction box to facilitate circuit wiring. Zinc bases are direct mount and should not be used with the optional junction boxes. Noter: 1 Light bulb not included. Order bulb separately. 2 If using LED bulbs, match the lens colour of the light module to the emitting colour of the LED bulb. 3 The flashing module accepts incandescent or LED steady bulbs only. The circuitry within the flashing module allows the bulb to flash ON and OFF continuously when powered. 4 Always match the emitting colour of the LED bulb to the lens colour of the light module. 5 Sound modules must be installed as the last component (top level) of the tower light assembly. 6 Tower light assemblies containing dual circuit sound modules may contain a maximum of four modules, consisting of three Light Modules and the Sound Module. 7Zinc Base should not be mounted on plastic junction boxes.